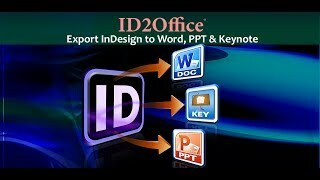 ID2Office v2.2 converts InDesign files to Word, PowerPoint and Keynote formats. Now with the latest InDesign CC 2017 support; with just a few clicks of the mouse you can save your InDesign files as Word, PowerPoint or Keynote type. ID2Office v2.2 is a plug-in for Adobe InDesign CS6, CC, CC 2014, CC 2015 and CC 2017 allowing anyone to easily export InDesign documents to common Office formats. 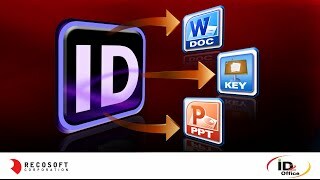 Learn how easy it is to use ID2Office v2.2 on Mac and Windows. So, Adobe has released the 2017 version of their Creative Cloud applications and we at Recosoft have been busy at reworking our InDesign plug-ins to work with the latest release. We’re introducing ID2Office v2.2 which now supports InDesign CC 2017. Just to recap ID2Office allows anyone to export an InDesign file to Word, PowerPoint and Keynote formats; and your data is editable with the layout preserved. Yes! Here we have InDesign CC 2017 running and guess what we have an InDesign file open. We want to export this InDesign file to Word format because my colleague uses Microsoft Word. ID2Office makes this conversion of InDesign files to Word really easy. So we choose the ID2Office – Export to Office format command and the ID2Office – Options window appears with in InDesign. The ID2Office Options window allows you to fine-tune the conversions and if you notice it says Microsoft Word at the top; so lets export the InDesign file to the Word format and check it out in Word! We click the Export button and the “ID2Office Export” windows appears. Lets name the file and click Save. ID2Office works its magic it finishes converting the InDesign file to a Microsoft Word doc format! Lets open the exported file in Microsoft Word and observe the layout fidelity and other details. You notice that paragraphs, text, tables and even style sheets and graphics properties are all there. That was easy. No more trying to recreate or rebuild your InDesign file using Microsoft Word, PowerPoint or even Keynote! You can now hand-off your InDesign files as Word, PowerPoint or Keynote formats and your colleagues or clients are super-happy; and you’re super happy also as ID2Office saves you so much time! 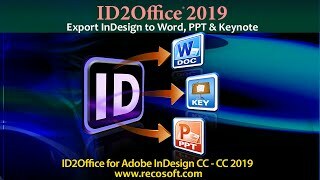 ID2Office v2.2 from Recosoft supports InDesign CS6 through InDesign CC 2017 and converts InDesign files to Word, PowerPoint and Keynote formats.